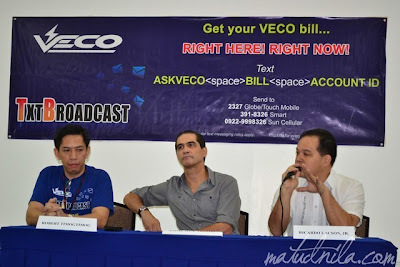 The Visayan Electric Company (Veco) has successfully launched its ASK VECO Text Service which utilizes this new and easy communication tool, called texting. The power utility sees the practicality of texting and adopts to this innovation. 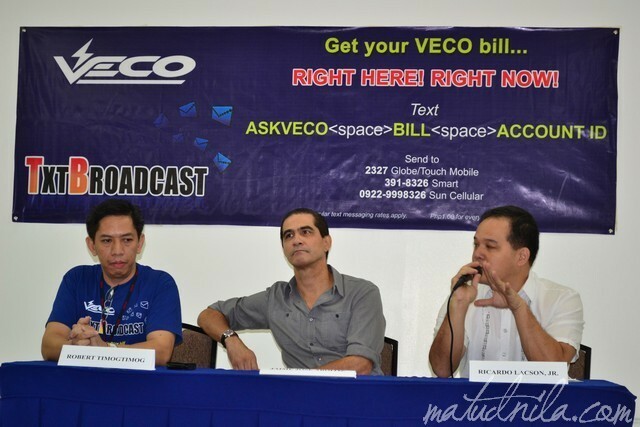 VECO customers can now get their monthly electricity bills by just texting anytime and anywhere. Below are some of the common information that you wanna know and just an SMS away. It's one of VECO's way to teach us on how to save energy, save money and save the environment. 0922-999-8326 for Sun cellular subscribers. These are outages that VECO schedules to maintain its facilities. Veco informs the customers affected through the Planned Power Outage Advisory (PPOA). PPOA is designed to push information thus, eliminating cost to customers. Customers can receive a text message and an e-mail only if they are the affected accounts. But first, they must register online by visiting VECO's website and click on the "Register Here" button, located at the top most portion of the homepage. On the online registration form, Veco Account name, Account I.D., e-mail address and cell phone number must be provided. For multiple accounts, same or other contact details maybe used, whichever is preferable to the customer. The Visayan Electric Company (Veco) is co-managed by the Aboitiz and Garcia families of Cebu, reaching out to the company's over 300,000 customers is one of its main goals. Getting in touch with an estimated 1.73 million residents in its franchise area covering the cities of Cebu, Mandaue, Talisay and Naga plus the municipalities of Liloan, Minglanilla, and San Fernando is made easier with these communication tools. 0 comments: on "VECO Power Outage Schedule and Monthly Bills Inquiry through Text"